Large Cable Cut-Outs: large open cut outs provide ample room for routing various cables such as copper, fiber optic, telecom, and power cables. Numerous Routing Variations: Cable routing panel can be installed to safely direct cables from left to right or front to back. Easily route cables from patch panels, routers, and switches that are mounted in the front of the rack to servers or other components that require the cables to be connected in the rear of the rack. Rounded Corners: Edges and cable cut-outs all have rounded corners for safe handling and installation. EIA Compliant: 19" EIA compliant routing panel can be installed in a wide variety of networks/electronic solutions such as 2-post racks, 4-post racks, server enclosures, and wall mount racks and cabinets. 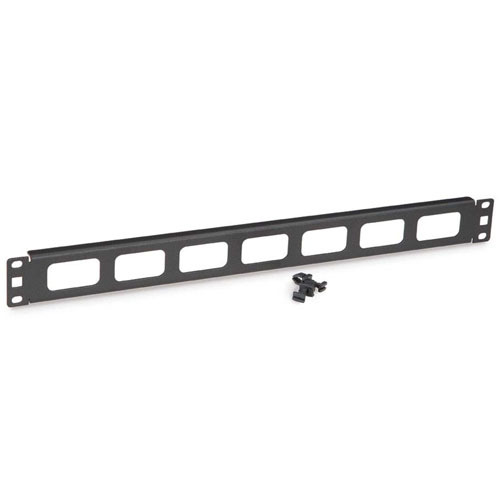 Tool-Less Mounting: For smaller cable bundle installations, the use of the included tool-less clips makes installation easy with universal cage nut style rails. For heavier cable bundles the use of rack screws and cage nuts are recommended.